Laoconnection.com: Lao BBQ Fish - Beeng Pa - So Simple Yet So Good! I love barbecued food. Luckily in Laos, they do plenty of it! 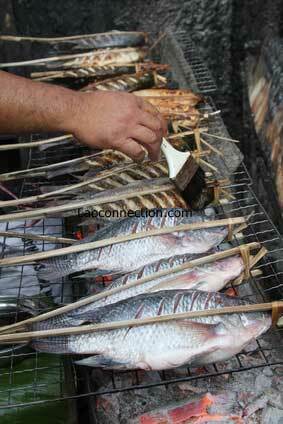 And in particular I do enjoy the healthiness and deliciousness of BBQ'd fish (beeng pa). It's often eaten with sticky rice or used as the primary meat in vegetable rolling (pun pa). The Lao way of BBQ fish is simple to do as only a few ingredients are needed. Gut the fish by cutting along its underside. Wash it inside and out. Slather it with plenty of salt all over and a bit on the inside (some people put lots on the outside and that helps to create a salty crunchy crust when it's finished bbq'ing). Make slits on each side of the fish diagonally as shown above. Place lemon grass (hua seeng ky) and, optionally kaffir lime leaves (by puk kee hoot), on the inside. Place it on the bbq. Cook on each side 5-10 minutes or at until it's cooked internally and nicely browned and crunchy on the outside. Optionally, some people like to brush a bit of salted oil to keep it moist yet crisp on the outside (as shown above). Remove from bbq and enjoy with sticky rice and some dipping sauce (jaew) or use it for pun and roll it up by hand with veggies and rice vermicelli noodles and enjoy with light sweet sauce. It's that simple! And it's so good. My favourite part of the fish is the belly. It's crunchy, flavorful and oily. That oily part is full of healthy omega 3 fatty acids. Enjoy! And if you're wondering why to put lemon grass or kaffir lime leaves it's because they impart a light and pleasant aroma and flavor into the meat (not to mention they are used quite often in Southeast Asian cooking).